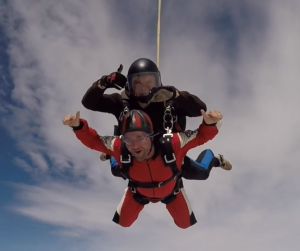 Two weeks ago, David Webb, experienced the “most exhilarating adrenaline rush” of his life, and all to help raise funds and awareness of M.E. on behalf of his wife Kellie who has the disease. Sometimes pictures, and in this case a wonderful film of David’s adventure say far more than words, so, this will be a short report on his challenge. David’s interview begins at 40 seconds, but you can still share in his experience of the parachute jump with the sound turned off. This is just one of the things that David Webb is doing to raise awareness of, and funds for M.E. this year. It is the first time that I recall any of our fundraisers being filmed throughout their whole challenge. It was humbling to watch all that David went through, and we’re all really grateful for everything he is doing on behalf of others suffering from M.E.